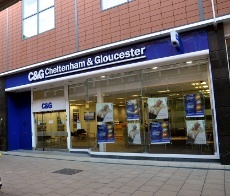 Cheltenham and Gloucester is part of Lloyds TSB Bank plc. The Crawley branch is in Queens Square. The former Cheltenham and Gloucester building society was bought out by Lloyds TSB, which intended to close it down, but later relented.